Election 2019: The Congress, which welcomed Shatrughan Sinha aboard just a week ago, has also named its candidate for the constituency - Acharya Pramod Krishnam. A day after actor-politician Shatrughan Sinha's wife Poonam Sinha joined the Samajwadi Party, its chief Akhilesh Yadav made it official. She will contest as the opposition gathbandhan or alliance candidate from Uttar Pradesh's Lucknow, where the ruling BJP's candidate is Union Home Minister Rajnath Singh. "I have learnt a lot from Shatrughan Sinha. Life is one big challenge and I will face it," Poonam Sinha, 69, said in her first press conference after joining politics. "We will 'Khamosh' BJP," she quipped, borrowing one of her husband's most famous movie lines. The bitterness after Akhilesh Yadav and his rival Mayawati teamed up in Uttar Pradesh without inviting the Congress to their newfound squad is perhaps at its worst in Lucknow. The Congress, which welcomed Shatrughan Sinha aboard just a week ago, has also named its candidate for the constituency - Acharya Pramod Krishnam. The Congress took the step despite a Samajwadi leader, Ravidas Mehrotra, appealing to the party not to field any candidate in order to defeat the BJP. At a press conference today, Akhilesh Yadav was asked who Shatrughan Sinha would root for. "If there is any campaign in Lucknow, it will be for Poonam Sinha ji," the Samajwadi Party chief replied, grinning. If the opposition votes are divided, Rajnath Singh is looking at a walkover in the constituency he won in 2014 with over five lakh votes. His nearest rival was Rita Bahuguna Joshi of the Congress, who is now with the BJP. Lucknow has voted the BJP since 1991. The party's tallest leader, former prime minister Atal Bihari Vajpayee, held the seat until 2004. 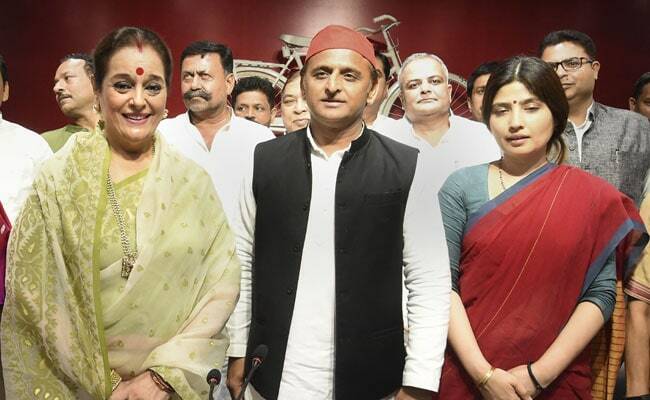 Akhilesh Yadav, appealing to voters to back Poonam Sinha, commented: "It is said that the first MP from here was a woman." Lucknow will vote, along with 13 other Lok Sabha constituencies of Uttar Pradesh, in the fifth phase of the national elections on May 6. The results will be announced on May 23.